In this photo you can see that the engine is connected directly to the pump. A shaft running from the engine into the pump is what drives this kind of configuration. Advantages: Lower initial cost of ownership. Fewer drive system components. The belt drive unit has the engine separated from the pump. 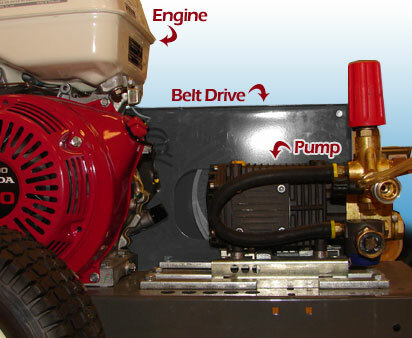 The belt assembly is what drives the pump. Advantages: Having the engine and pump separated means less heat. Superior at absorbing the movement of the engine. 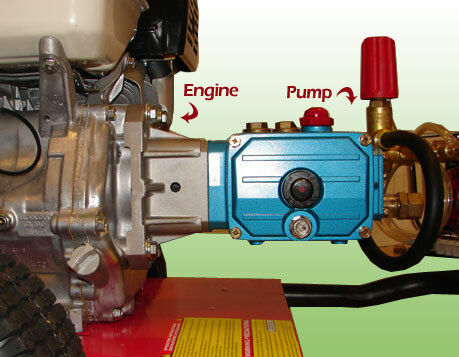 The pump runs at half the speed of a direct drive unit. These three things contribute to the long life of a belt driven pump system.